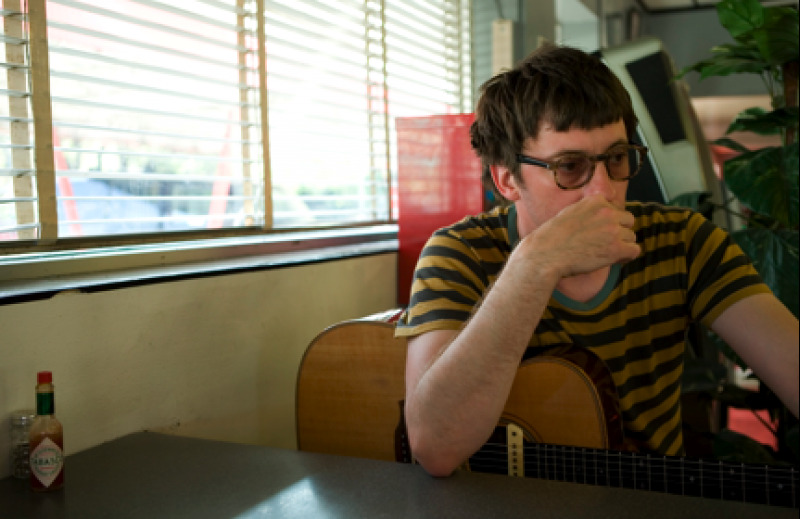 Graham Coxon releases his brand new album “The Spinning Top” on Transgressive Records on May 11. The album was recorded in London in Spring 2008 and features musical contributions from Robyn Hitchcock and Danny Thompson, amongst others. It was produced by Stephen Street. “The Spinning Top” features 15 brand new tracks and marks something of a departure in sound and feel from previous Graham Coxon solo work. It is also unusual in that the songs follow a narrative – nothing less than the story of a man from birth to death! Graham says: “The album is mainly an acoustic journey although there is, of course, some explosive electric guitar action. I wanted to show how exciting acoustic instruments can be, how dynamic and rich and heart-thumpingly raw they can sound at a time when acoustic music seems either too cute or too soppy. Obvious influences here are the amazing Martin Carthy, the late, great Davey Graham and the late, great John Martyn”. “There are some guests too! Robyn Hitchcock supplies some counter-attack guitar, Jas Singh plays dilruba and jori with his friends Gurjit Sembhi on taus and Jaskase Singh on esraj. Danny Thompson plays the legendary Victoria, Graham Fox gives plenty of swing on the drums and sizzle cymbals and Louis Vause tinkles the ivories”. “My friend Lucy supplies the voice of the wife and Natasha marsh channels the voice of the Medea-like enchantress”.